If you want fuel efficiency, easy handling, great power control, spacious interior, and elegant design, then this is the vehicle you will want to look for. The Fiat Doblo's sliding side doors and deep boot make it a good family car, and it has enhanced stability control for safer driving and better handling on the road. It seats 7 easily and has all the room you could ask for in the rear! It comes standard with airbags and ABS, is highly fuel efficient, and is a great vehicle all around. 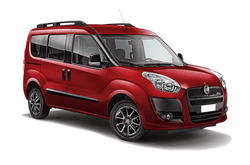 Be sure to check out the Fiat Doblo for yourself and see why it is the model more people are talking about and why more people are asking for it when they need car rental services! Don’t miss out, get yours today while you still can!